While we will always take the utmost care of any system, Gremlin Computers will take no responsibility for lost data. In the event that data loss occurs while a system or systems are under our care or have been submitted to us for repair, Gremlin Computers may need to reinstall or restore data from your most recent backup and may incur an additional fee. Our staff will work to ensure that data is kept safe and intact however, it is the client's responsibility to ensure that they have up to data backups and original software CD’s (or appropriate backups) in the event that Reinstallation is necessary. Systems, parts and peripherals purchased from Gremlin Computers carry their respective manufacturers warranty and any Warranty that Gremlin may provide would only be an extension to the manufacturer's warranty. Gremlin Computers pass on the manufacturer’s warranty but that in no way substitutes or replaces the manufacturer’s warranty. With some peripherals from manufacturers such as, but not limited to Hewlet Packard, IBM, Toshiba, Canon, Viewsonic, Kyocera, Samsung, LG and Sony, all warranty work must be conducted through the manufacturer's Nominated service departments and Gremlin Computers assumes no responsibility for these products. In some circumstances an additional labour charge may be levied if the work being requested falls outside the manufacturer’s warranty (eg. data recovery, Operating System Restore). As a part of repairing your system, technicians may be required to, or may inadvertently view files. Clients must accept this as a condition if repairs are required. Gremlin staff are entirely within their rights to refuse immediate service to clients if it is not an emergency*. Emergency being where computer systems and or networks are in a state or condition that prevents a client's staff from being able to work. In the event that a client's behavior is deemed unacceptable (eg. Verbally or physically threatening, abusive, Sexually or racially vilifying), staff may refuse service. Where a client requests work to be conducted on a system which has software that is installed in breach of it's License agreement, or is requested to install software which has been illegally copied or is in breach of it's license agreement. 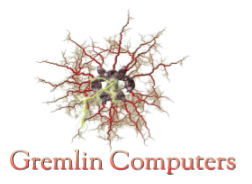 Gremlin Computers have the right to refuse to work on systems which are using software that is in breach of it's license.